Glad you got your visa and that you find this board useful. I am sure Anya know everything and will take you to the right places to buy clothes etc...... and as most RW she is probably a frugal one..... and will take care of your spending money! 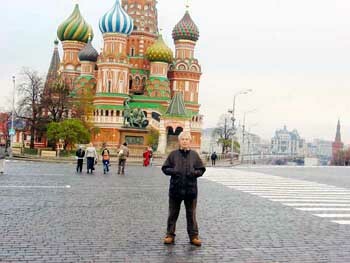 Moscow it's a nice place to visit and very impressive, (I was as you can see in the photos) in my view. As about the weather..... as "Donhollio" would say, you have your human heater to keep you warm! Personally I have to apologise to you and anybody else for not been around, lately, but I had to deal with a big disaster on my PC. Finally I have re-installed almost everything and start working normally. I may make a post on another forum and tell you of what happened and lost all programs etc. Warning: Anybody using the "Norton Ghost" program be very careful. Also if you are using "Google Chrome", I would switch off "automatic updates" because soon or later you will fall to their new tactics and accidentally install a vicious advertising program that installs Java script in your browsers.... and floods you with advertisements. It took me hours to completely clear my computer. Well I will be waiting for your photos.... and not long time to go, before you will be landing in Moscow! PS: Can you please upload an avatar so we can recognise the poster at a glance? My Girl Anya is very good with money saving and budgeting etc. She has been looking for places to get suitable clothing for me so fingers crossed I will have something to keep me warm on arrival, I can't wait to have my human heater again lol. I always enjoyed Moscow and I am sure you will have a great time. I have been to Moscow about 15 times and Russia about 20 times. I liked every place that I went to. Moscow is a great city to visit. If we ever do end up there at the same time I would be most happy to meet up with you (or Wiz too of course) but I think the odds are my days of visiting Russia are over. My wife goes back every other year and brings her Mom here on the off years and her stays are long enough that I need to stay here and tend the store (so to say). My wife will be heading back again around May. I can't really suggest a good place to buy clothes in Moscow. There are lots of shops in Gum and the other shopping center but they will be pricey. I used to go to something called the VDHK park which was like a big flea market with lots of shops thrown in but they tore that down. I was sad to see that and loved the place. I have heard there is something similar near Gorky Park. Your gal may know about that. I have been to Moscow in Dec, Jan and March and it can get nasty. One trip I made to Kiev and Moscow had temperatures of -50. My March trip had 3 feet of snow on the ground. Where did you go in Thailand? When my wife and I were getting to know each other we also went to Thailand. We spend a couple of days in Bangkok and then much more time in Phuket. That was in January but a winter coat wasn't something we needed there. That was about the hottest sun I have been in and we could get a sunburn even trying to stay out of the sun. Loved it there however. That was a really nice picture of the two of you. You make a nice couple. I am glad to hear she is good with money and budgeting. RW seem to go one way or the other. They are either very wise with money or spend it like Jackie O. My wife is the frugal kind and I think I spend less married than I did single and that is with putting her though college. My wife works part time in my business (2 partial days a week) and she is so frugal we can almost live on her pay and bank mine. I had some experiences with RW that were the opposite like one gal I took to dinner in Moscow. My dinner was $ 40.00 and the total bill with hers was $ 550.00 then she wanted to take me to a nightclub with a $ 250.00 cover charge. I don't think my wife has ever wanted a dinner out that was over $ 10.00. Will check out Gorky Park for sure I spoke to Anya this morning on skype before work, she knows exactly where we will go. Now onto Thailand, Anya and I spent 10 days in Phuket we stayed at the Outrigger Laguna Beach resort up north in Bang Tao. The most amazing place I have stayed to be honest. I also have a friend that owns a bar in Patong so he organized a few tours for us until we hired a scooter and just did our own thing which was even more fun. Being from Queensland Australia the weather there was very similar so for me it was ok however Anya got a little sunburnt even wearing Sunscreen, after 10 days there we felt like locals and now pretty much have our Thai group of friends so we intend on visiting Phuket each year. Thank you for your comments on our picture we are very happy together and I think it shows in our Pictures as you will see on my return from Moscow. Anya is really excited about cooking for me and playing happy married couple living together and has renovated her whole apartment over the past few weeks which looks amazing and I can't wait to put the finishing touches together for her. The hardest thing in this whole situation is the count down until you see each other again, They say it easier not to count down the Months weeks days etc but it gets a little hard when you are only just over a week away from seeing each other again. Sorry boys joining late.... power cut last night corrupted my windows XP, and I just managed to repair it! I agree with Turbo..... very nice looking couple and very happy I see.! Taz thanks for your effort to upload an Avatar.... and more importantly thanks for showing us your girl, Anya! Well looks that Anya knows all about Russia and what to do so I will leave you in her capable hands! Turbo..... mine is slightly the opposite and a problem for me! When it comes buying presents for family and friends.......she has no problem spending lot's of money! And I mean big money for my liking! When it comes to spend money for herself, that is another matter ........ we always end up having arguments and I have to force her to buy anything she likes or I like. From her 1st visit in the UK, back at Christmas 2007, and everywhere we go..........same arguments. For her last trip to Russia..... she spent over $500 for presents and came back home with only 1 item for herself.....costing just over $20. You can imagine what happened when I frog marched her to the shops to buy some more new items..... and she came home with less than $100 dollars overall cost! Now my friend "Eko", who lives a mile away from us, has married a Belarussian woman and these 2 go out shopping together ...... but her habits have not changed! Oh well.... I have to give up! PS: Turbo or anybody else..... if you are passing through London airports..... let me know and I will buy lunch, coffee or a drink! I am only 30 minutes away from Heathrow and Gatwick! Wiz, My wife is also good at buying presents for people when she goes back to Russia but when it comes to shopping for herself she is a very particular tightwad or in more polite terms a very careful and thorough shopper. I like it much better when she goes shopping alone. She shops some of the less expensive stores and will spend hours filling a shopping cart with clothes. Then she goes to the dressing room to try them on and most often doesn't like the fit on any of them and leaves them all there. On a good day in 4 hours she might buy one thing. When I shop for clothes I go to a department store and in 45 minutes can buy myself everything I need to get through the next year. Well, that is unless she is along. I have been to Gatwick and Heathrow many, many times but that was in the past. I never know when I will end up heading someplace and if I ever do get to one of those airports I will definitely let you know. If you and Hanna ever do make it to the USA let me know and if I will be any where near where you are I would be happy to hook up with you. I have toyed with the idea of visiting Ireland while Iren is in Russia which would have me transiting London but doubt if I will do it. My ancestors came from the Londonderry area 2 centuries ago. I have been to London a dozen times but never Ireland or Scotland. I almost went to Ireland once but there just wasn't enough time in my trip. Ireland is one of the few places on my "Would love to visit list" Scotland is also on the list. Daz, I remember those days well when my wife and I were apart and waiting for her visa. The time seemed to pass so slowly. Once it is behind you it seems like it went quickly. Our visa got delayed in Administrative Review for about 4 months which didn't help. I liked Thailand. I don't recall the name of the place we stayed exactly but it was Marina something. It was cool. There were modern cottages scattered over a few acres of beautifully landscaped jungle gardens. We had our own kitchen, living room and bedroom and lots of privacy in a beautiful setting. The beach was perhaps 300 feet from where our cottage was and they had a couple of nice restaurants. We were close to a shopping area and there was a Russian restaurant a few minutes walk from our hotel. We made a few excursions. The one that was the most interesting was a bus and then long tail boat to James Bond Island with a bus stop at the Monkey cave on the way. James Bond Island was featured in the movie "Man with the Golden Gun" and on the bus ride they showed the movie. Daz hello and to RWF. Nice to hear another successful visa application and 2 more happy people. Wish you all the best of luck and hope that all will be fine with your lady! Moscow is a very modern and nice place to visit... bit expensive but worth visiting. Have a good trip and let us know your impressions about Moscow and Russia. My Girl Anya met me at the airport and was acting like an excited puppy dog when she first saw me and I must admit even though I was suffering Jet lag I was much the same. You was right Wiz, Russian woman love to look after their men in every way possible. Her apartment is a small studio type apartment but very cosy and I must admit her renovations for my arrival she had done an amazing job Anya & her mum. It felt weird waking up at 9am in the morning and looking outside the apartment to find it still dark with street lights on etc as in Australia the sun is normally coming up at 530am. 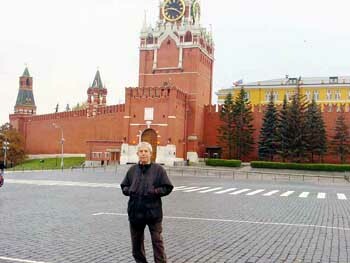 We went to the Kremlin, Red square and saw a lot of the cathedrals which was really cool. Being from Australia (Such a young country) it blew my mind to see buildings and treasures that dated back to 12th century. We also got to see The Tzars treasures exhibition which was amazing too. It was good to stay as a couple and see what it would be like to live in such a small apartment together doing all the simple things which so many people take for granted but we enjoyed every minute. I will update some photos of my trip when I get a chance Wiz but it is cool now to see your photos and understand exactly where you are standing i.e red square etc. If we start the process of admitting we have met and are traveling to visit each other? Anya thinks that we should just do the Tourist visa but to me it seems this will just delay the process further down the track if we decide that she will come to live here or me there. Thank you all for your support and advice, it is great to have people that you can share your thoughts & worries with and I enjoy visiting this site.